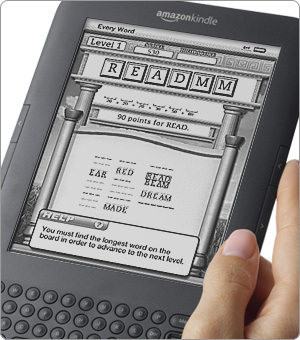 A long time ago Amazon seemed to promise the ability to program for the Kindle using their own KDK (get it?). It seems folks have started rolling out smallish apps for the the platform which could spell an interesting plethora of contributions including paid apps. Your score is comprised of two components: first make a lot of words, second try to make the longest word possible in each scramble. The best way to increase your score is to do both, but it’s a huge bonus to find the longest word possible. Why? Because when you do, you earn the right to play a completely new level with a brand new set of letters. As long as you keep finding the longest word, you can move on to a new level with a new jumble of letters and push your score higher and higher. Whatever. Anyway, I could definitely see this as a great way to add Sudoku and crossword puzzles – potentially branded by the big names. Obviously we’re also dealing with a very limited set of data entry elements on the Kindle proper, so games would be hobbled. Add a touchscreen into the mix, however, and you’ve got a minxy good time. Wordgames may be most popular for the casual user, but I could also imagine a sort of writing/notetaking system or even a blogging system built-into the app. Imagine reading a book a reviewing it on the fly and you kind of get what I mean, although that sounds about as much fun as dentistry. Regardless, keep your eyes peeled for more KDK apps this month.